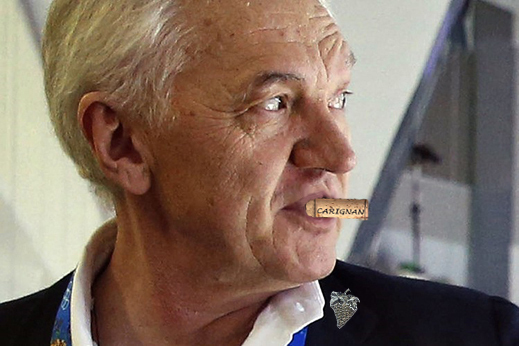 On November 13, Gennady Timchenko (lead image), once the oligarch controlling the greater part of Russian oil movement from well-head to market, established a new line of business. He called it Carignan, after the Mediterranean grape variety, and he put his public relations agent in charge of the company as chief executive. The company is so new the President of the Russian Union of Winegrowers and Winemakers, Leonid Popovich, hadn’t heard of it. On December 9 Kurevin told the Moscow business press that the company has been established by Timchenko to attract an investment partner for establishing a vineyard in the Krasnodar region, the centre of Russian wine growing. The day before, at the state property fund of the region, Kurevin had lost the bidding for 534 hectares of new vineyard land. The winner was Abrau-Durso, the leading producer of sparkling wine in the region, which is owned by Boris Titov, the state appointee as ombudsman for entrepreneurs’ rights. Abrau-Durso won the privatization with a bid of Rb677.3 million ($9.5 million). Carignan had pulled out, according to Kurevin, because the price rose too high. Titov’s son Pavel, chief executive of Abrau-Durso, agreed the competition for the land had sent the price 25% over fair value. But he explained Abrau-Durso was determined to shut out the competition. A day later Kurevin told RIA-Novosti that Carignan is thinking of “future possible joint projects in the industry with one of the largest producers.” He didn’t say whether he meant Russian winemakers or foreign ones. The Russian industry isn’t welcoming, though, and so it’s unclear if Timchenko will be able to avoid the European Union (EU) sanctions in order to do a deal with the French whom he knows best. The US and EU sanctions cover French financing for Timchenko and exports of wine. Trade in vine seedlings is allowed. After Carignan was defeated in its first bid for state-supported acreage for planting, it is unlikely Abrau-Durso, with a current market capitalization of Rb6.9 billion ($99 million), interested in cooperating with Timchenko. For the dossier on Abrau-Durso, once the best growth stock on the Moscow MICEX stock exchange, and on its politically influential owner Titov, read this. Asked what Abrau-Durso thinks of Carignan’s potential in the business, Maria Bogdankevich, the Abrau-Durso spokesman, replied: “About the Carignan company we cannot comment on the investment and productive capacity of a separate, independent company. We don’t have such information.” Phanagoria, another well-known Krasnodar winegrower, has said that for Timchenko, Russian vineyards might be as fashionable now as the French ones used to be. Timchenko’s attempt to break into the wine business upstream, at the vineyard, isn’t his first investment in the sector. Downstream in 2005, at the wine-consuming end, he and his wife Elena Timchenko acquired the hotel Club de Cavaliere in 2005, through a Luxembourg-registered entity called Sogeco. 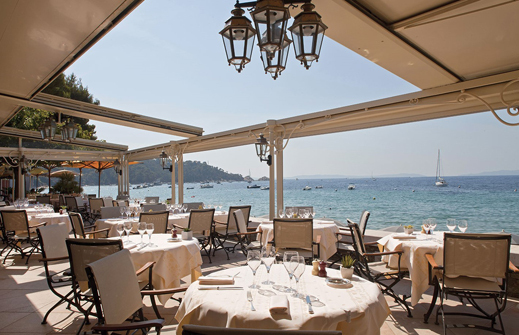 The hotel (below) is a 5-star establishment near St. Tropez on the Cote d’Azur. For more details, see this. Timchenko also took a 40% stake last year in 310 hectares of apple orchards in Krasnodar. The grower is called Alma Group, registered in Luxembourg. The Moscow press reports this entity also includes a French real-estate manager, Jean-Claude Menn. Luxembourg records for Alma say that its purpose is to buy and sell assets, or act as borrower or guarantor for borrowings. Three Luxembourg accountants act as the company’s functionaries. The beneficial owners are not identified. Russian winegrowers say the wine business is much less profitable than the oil trading which has made Timchenko’s fortune. But the impact of US and European Union (EU) sanctions, and counter-sanctions by Moscow, have transformed the Russian wine market, raising its potential value to growers, investors, and consumers alike. Source: Federal Customs statistics; value is in USD; volume in tonnes. 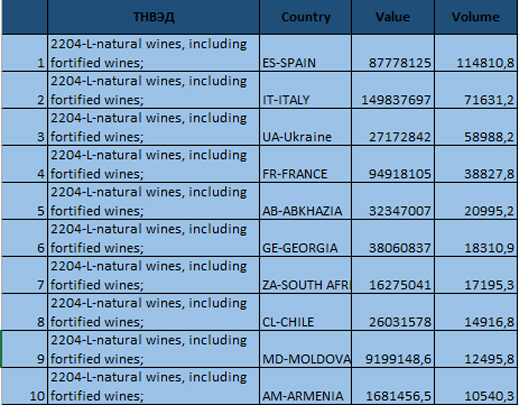 Two tables were recently compiled and published by the Centre for Research of Federal and Regional Alcohol Markets (TSIFFRA) in Moscow, showing the best Russian white and red wines in international tasting competition; see. Industry reports suggest that following the start of sanctions and counter-sanctions, then the rouble devaluation, in the first half of this year there has been an overall drop of 2% in the Russian consumption of European wine. 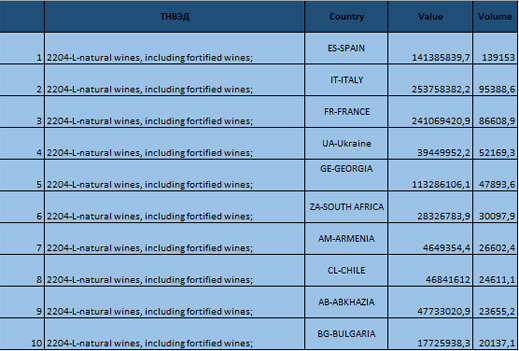 The two tables show there have been sharper declines than this in imports of French, Spanish, Italian and Bulgarian wines by comparison with 2014. Those who were used to drinking European wine have shifted to Crimean wine. There has also been a rise in imports of low-price Chilean, Georgian and Moldovan wine. But Russian-labelled wine isn’t exactly that. Until now, industry sources acknowledge, one bottle in four of Russian wine bought by consumers is grown and produced in Russia; three bottles in four are bottled in Russia using foreign wine stocks. Abrau-Durso and other up-market Russian vignerons use mostly South African and Italian materials; the low-cost bottlers use mostly Moldovan supplies. As for new vineyard plantings, roughly 90% of the seedlings Crimean winegrowers are planting have been imported from Serbia, Italy and France. Importation of seedlings from the EU is permitted by current Russian rules, but the permit process for the plant stock is slow, and may get slower if the Kremlin approves protective measures for domestic growers. Still, says Vadim Drobiz (right), “the crisis has led to success in the wine sector”. Drobiz is the head of TsIFFRA and one of the leading experts on the Russian alcohol industry. “Earlier this year, the domestic share of Russian wine consumed in the market reached a record for the past 20 years – 75% of the volume. In recent years, it was less than 60%.” Wine production in Russia this year, adds Drobiz, has increased by 30%, while wine consumption in the ten months to Ocober 31 has been growing less swiftly, by 3.5%. Wine drinkers have increased their consumption of Crimean wine by 7% this year. The Kremlin has responded to the crisis by cutting the excise tax levied on wine from 8 roubles per bottle to 4 roubles for Russian wine entirely manufactured in Russia. New wine-labelling regulations will require the Russian origin of wine to be more visible, and allow consumers to detect which wines have been grown, as well as bottled in Russia. Accompanying the excise and labelling changes is the protective introduction of appellation of origin (AO) for Russian wines. This will take time because there is as yet no ready register of Russian wineries and vineyards by geography, varietal grape, or brand-name. Also promised is a substantial increase — more than double – of the cash subsidies from the federal Agriculture Ministry budget for the costs of new plantings. According to Drobiz and other sources, the policy changes are due to the concerted effort of Boris Titov and the Agriculture Minister, Alexander Tkachev. Both are established winegrowers. Boris Titov, left, with Alexander Tkachev, right. Olga Tkacheva, the wife of the minister, owns a small Krasnodar vineyard and winery with the name, Chateau de Tal. Last year, according to local press reports, it made sales (bottled wine, winemaking materials) of Rb24 million; its losses came to Rb23.5 million. 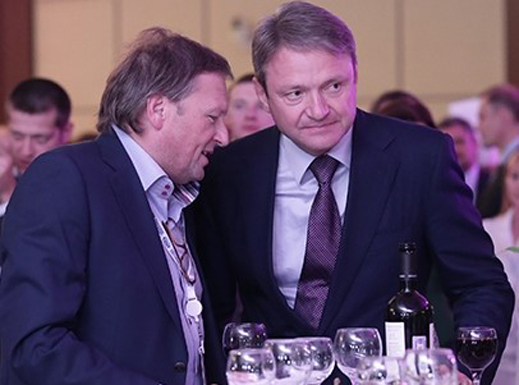 Titov and Tkachev are credited with overcoming the federal Finance Ministry objection to lowering the excise tax on Russian wine. They started by proposing a zero rate; they agreed to a compromise of half the going rate. At the moment, sanctions are stopping foreign bank loans to Russian farms and winegrowers through the international ban on refinancing of the state-owned Rosselkhozbank (Russian Agricultural Bank). That, plus rouble devaluation, have sharply raised costs for Russian winegrowers to import specialized irrigation and processing equipment, as well as plant material. The increase in budget subsidies, foreshadowed in the official measures issued in July, should cover 80% of the projected new costs of plantings, says Popovich of the winegrowers union. “The industry needs to be confident that the support [from government] will last for years, then they will plant.” Industry estimates at present indicate the minimum level of investment will be Rb1 million ($14 million) per hectare. For the time being, there has been no rush of Russian winemakers to Crimea. Today, half the total area of vineyards in Russia – that’s almost 31,000 hectares – are counted in Crimea. But the numbers are deceiving. Industry experts claim that about a third of the nominal vineyard area in the peninsula is over 25 years old, and requires replanting. The effective fruit-bearing area in Crimea is currently only about 18,000 hectares. For details of the state plan devised by Titov to boost winegrowing in Crimea, see this report of a year ago. Results since then have been meagre. According to the Crimean Ministry of Economic Development, in 2014 Crimean wine production fell by 20% compared to the year before – 43 million litres of wine down to 34 million litres. However, in January of 2015, there was sign of recovery – production of wine was up 50% compared to January of 2014. Crimean officials acknowledge the productivity of their vineyards is half that of vineyards in Krasnodar region. 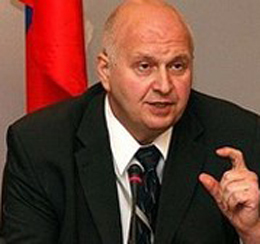 Among the Russian vignerons already established in Crimea, before annexation, there is Vagit Alekperov, control shareholder of LUKoil, and Andrei Kostin, chief executive of state-owned VTB Bank. Timchenko’s plan for Carignan received a set-back when it failed to buy Krasnodar land, and there is no indication from Kurevin on whether Crimea will be selected next. Without paying for land on which to plant its vines, Timchenko and Carignan cannot qualify for state money with which to plant grapes.